Yeah I know that every review I post is spooky, but it's the month of October so just role with it. This is one I've been trying to review for the past month but other things have gotten in the way. 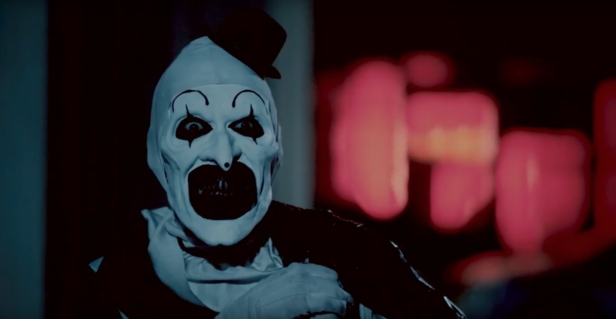 Now it's time to shine a light on Terrifier. This one received a bit of hype due to the creepy clown killer featured on it's posters and trailer. Is all this enough to lead to a great horror experience? Let's take a look. The movie begins in a talk show as a woman with a deformed face is being interviewed. Her face is the result of an attack from a killer clown known only as Art. The talk show host ends up making fun of her and...... well let's just say it doesn't end well. Cut to Halloween night and we follow two girls, Tara and Dawn, as they make their way home from a Halloween party and decide to get some pizza. They run into Art the clown and things start to get weird. He won't stop staring at Tara and he never makes a sound the entire time even with all his creepy poses. I'm not usually bothered by clowns but by god this one is absolutely the creepiest one I've ever seen. He can give Pennywise a run for his money any day. He's played by David Howard Thornton and apparently this is his big screen debut which is mind-blowing because he comes across as an absolute pro here. He's in the movie pretty much straight away and I was worried that he would start to become boring as the movie went on. He never did. If anything he somehow grew creepier as it continued. He even got a few chuckles out of me too. I really need a sequel or a prequel to see him again. I loved him. There's one scene in particular where he decides to dress as a woman in order to trick another character and it's honestly one of the most disturbing things I've seen and will haunt my nightmares for the rest of my life. His movements are just so unnatural that it can't help but turn your stomach. Another bit of proof that you don't need shite jumpscares to get a proper good scare on the audience. The movie does come across as a gritty kind of B movie but it completely works to it's advantage. It's almost like Robert Rodriguez and Eli Roth co-directed this. While no other characters outside of Art really stood out, everyone performed well here with no one coming across as bad which did surprise me. There is one character simply known as Cat Lady and I have no idea what her purpose was here. Her strange character is never explained as she just seems to live in the bowels of this building and no one knew she was there and she believes a doll is her baby. Granted she does give us a few creepy scenes with Art so I'll give her a pass. For anyone not into gore you're going to want to stay from this as there is tons of it splattered around the place. I don't want to go into spoilers because some of the gorier scenes are really inventive, but my goodness a lot of the things I've seen here will stick with me. I don't think I'll be able to take a selfie again (if you've seen it you know exactly what I mean). Overall I had a blast with the movie and I think it's destined to become a future Halloween classic; one that you can watch with your friends and just enjoy. I know some movie critics look down on it as they see it as exploitative cinema, but as a horror fan I couldn't have been happier. You've got a joyously over the top antagonist and a plot that keeps you guessing. What more could I ask for? Definitely check this. Unless your squeamish and hate clowns. Then definitely don't.